Russia is slowly becoming a theatre of competition for India and China to secure energy to fuel their industries. In a race to catch up to China, India plans to further enlarge the scope of investment in the Russian commodity market to fuel its industries for coming decades. As part of this strategy and also because of favorable commodity prices, India has offered to jointly develop coal fields and mines in Russia. An official team led by Ramesh Abhishek, secretary, Department of Industrial Policy and Promotion conveyed India’s willingness to invest in Russia’s coalfield and mining sector. “The Indian side expressed interest in joint development of coal fields and iron ore mines in Russia. They agreed to exchange information on such areas having potential for cooperation,” the Ministry of Commerce and Industry said. 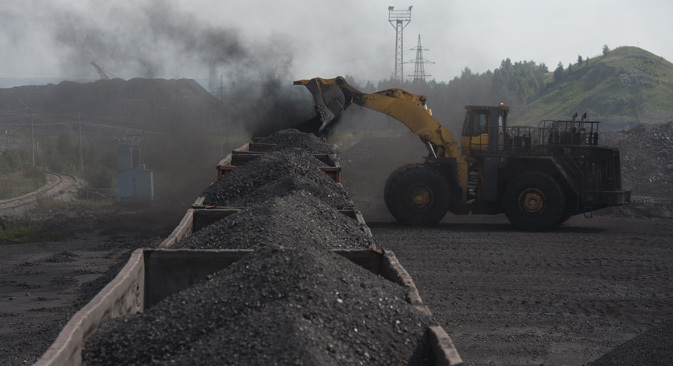 In the recent past, investment in the Russian coal sector has declined drastically to a level below USD 1 billion in comparison to more than USD 2 billion in 2013; mostly due to low commodity prices and higher expenses of domestic companies. In absence of high level of investment, Russia may lose its competitive advantage in the international market. India is taking this situation as an opportunity to grab for future needs. India has already made investments in Russia’s oil and gas fields in a big way and has plans to increase investments in future as well. As Sputnik reported earlier, ONGC Videsh Ltd. (OVL), the overseas arm of Indian state-owned petroleum company Oil and Natural Gas Corporation (ONGC), is exploring the opportunity to acquire a 49% stake in Russian oil producer Rosneft Oil Co.'s Tagul field. During the 5th meeting of the India-Russia Working Group on Modernization and Industrial Cooperation, both sides expressed mutual interest in developing the long-term and mutually beneficial cooperation in the field of mineral fertilizers. Both sides also identified specific areas of cooperation in the field of mining and metallurgy. Other specific fields identified for enhancing cooperation included technology for production of CRGO steel in India, the pharmaceutical industry, the modernization of steel manufacturing facilities in India and participation of Indian power equipment supplier in modernization of Russia’s power sector.